What makes Hawaii so unique? We'll begin our exploration with the geography and geology of the islands. Some of the things may seem very obvious, others are likely to surprise you. Whichever the case, you'll have to visit Hawaii to see these in person, since that's the only place on Earth that you'll find them. From time to time we'll look at more things that you'll find only in Hawaii and which make Hawaii unique in the world. Hawaii is the only state that is comprised totally of islands. How many islands are there in the Hawaiian Islands? It depends on who you ask. In what is officially the State of Hawaii, there are eight major islands, from east to west: Hawaii Island which is often called the Big Island, Kaho'olawe, Kaua'i, Lana'i, Maui, Moloka'i, Ni'ihau, and O'ahu. These eight islands that comprise the State of Hawaii are, however, just a small part of a much larger chain of islands. They are just the youngest islands in an immense, mostly submarine, mountain chain located on the Pacific Plate and consisting of more than 80 volcanoes and 132 islands, reefs, and shoals. 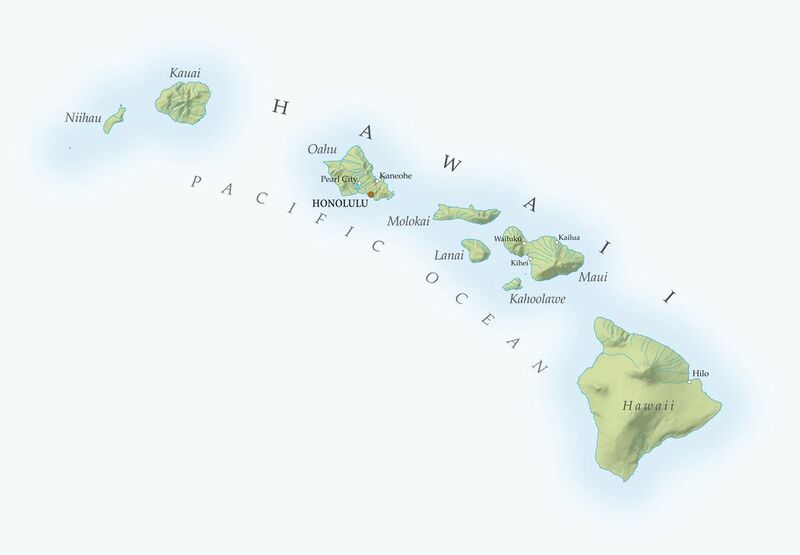 All of these islands make up the Hawaiian Island Chain or Hawaiian Ridge. The length of the Hawaiian Ridge, from the Big Island northwest to Midway Island, is over 1500 miles. All of the islands were formed by a hotspot in the earth's core. As the Pacific Plate continues to move west-northwest, the older islands move away from the hotspot. This hotspot is currently located beneath the Big Island of Hawaii. The Big Island was formed by five volcanoes: Kohala, Mauna Kea, Hualalai, Mauna Loa, and Kilauea. The latter two are still active. A new island has already begun to form about 15 miles off the southeast coast of the Big Island. Named Loihi, its seamount has already risen about 2 miles above the ocean floor, and within 1 mile of the ocean surface. In another thirty or forty thousand years, a new island will exist where the Big Island of Hawaii currently rests. The Hawaiian Islands are the most isolated, inhabited pieces of land in the world. They are located almost 2400 miles from California, 3800 miles from Japan, and 2400 miles from the Marquesas Islands - from which the first settlers arrived in Hawaii around 300-400 AD. This explains why Hawaii was one of the last inhabitable places on earth settled by man. Hawaii was also one of the last places "discovered" by settlers from the New World. The English explorer Captain James Cook first arrived in Hawaii in 1778. Hawaii's strategic location, in the middle of the Pacific Ocean, has also made it a highly sought after piece of real estate. Since 1778 the Americans, British, Japanese and Russians have all had their eye on Hawaii. Hawaii was once a kingdom, and for a brief period of time, an independent nation governed by American businessmen. We previously mentioned that the Hawaiian Islands were all formed by volcanoes. On the Big Island of Hawaii, in Hawaii Volcanoes National Park, you'll find Kilauea Volcano. Kilauea has been erupting continuously since 1983 - over 30 years! This is not to say that Kilauea was quiet before 1983. It has erupted 34 times since 1952 and scores of other times since its eruptions were first tracked in 1750. It is estimated that Kilauea began to form between 300,000-600,000 years ago. The volcano has been active ever since, with no prolonged periods of inactivity known. If you visit the Big Island of Hawaii there's an excellent chance that you'll be able to see nature at its most infant state.